One night a year book lovers around the world volunteer their time to hand out books to those who don’t see themselves as “readers” and/or don’t have access to books. 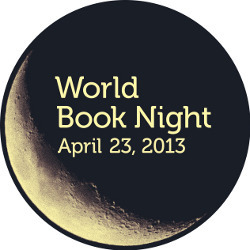 I’m excited to be participating in World Book Night 2013! I’ve been aware of World Book Night for years but I didn’t realize how organized and widespread it was. Last fall a coworker suggested we sign up as volunteers, so I went to the World Book Night website and found a volunteer application that requires an explanation of why you would be a good volunteer ( i.e. why you love books) and what location in your city/town you think would be a great spot to hand out books. Without hesitation I started filling out the application, thinking long and hard about why I love books and why I am qualified to be a literacy advocate. My love of books began with the supportive teachers who taught me how to read, and how to enjoy reading. I also had parents who encouraged my thirst for books by always borrowing, lending, or buying the books I might have been interested in. This led to my love of reading to escape my day-to-day surroundings— being absorbed by a story is a magical way to forget about all those rational, realistic obligations and responsibilities we’re required to consider and accomplish each day. Since I had these fantastic opportunities that most of us (myself included) take for granted sometimes, I figured it was time to share this with my neighborhood. Luckily, I was selected as a Book Giver and started receiving email updates from World Book Night informing me of which book I will be handing out (Bossypants, by Tina Fey) and where I would pick them up (my local independent bookstore). When I was given the green light to pick up my books, I went to the bookstore and received 20 copies of Bossypants with a smile, a flower (this was something the bookstore did on their own, and it certainly made my day), and a “thank you” from the bookseller. 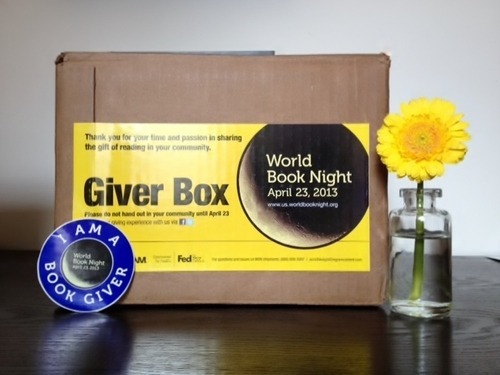 With books and Book Giver instructions in hand, I (and thousands of volunteers across the world) will be handing out one of the 2013 World Book Night titles on April 23rd in our neighborhoods to help encourage reading for pleasure and, in turn, literacy.